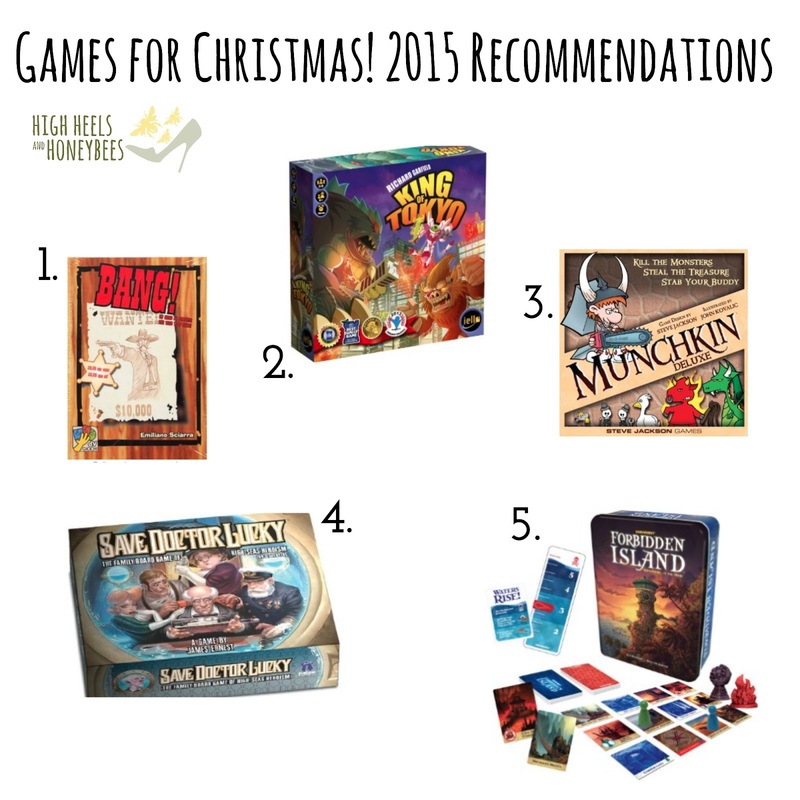 Christmas Shopping List 2015: Games! | The House of Martins The House of Martins: Christmas Shopping List 2015: Games! Christmas Shopping List 2015: Games! We are big board / card game players in this house. Our Christmas traditions include classic card games like Canasta and Cribbage and crazy more complicated board games like Small World. So I'm sharing with you some of our favorites. I'm going to start with Bang! An awesome card game that is based on the spaghetti westerns (and has the Italian subtitles to prove it!) and has elements to keep a lot of people happy: some cooperative play, some conniving play, some role-play and some simple card play. We've played with a wide range of people and everyone who has played it - enjoyed it. There are some great expansion packs if you get that far. A game that has so many expansions and versions that it will make your head spin is Munchkin. This game isn't for everyone. My nephew likes it and those of us in my family that are big game lovers - like all the versions we've played. But it isn't for everyone and is a little more complicated that Bang! and King of Tokyo. Still a really fun game, though. A very well designed game is Kill Doctor Lucky - and while it might be hard to get your hands on a copy of it - Save Doctor Lucky or the Kill Doctor Lucky card game are great options. A great game for Clue lovers who want to step up their game choices. Forbidden Island is a great cooperative game and fun for a variety of ages and gaming experience. This has won a Mensa award and while being a great game in learning cooperation - it also has a great design to it. Under $20 - makes it a really affordable game choice. Ok. I'd love to hear some other suggestions. I have a few new ones we'll be trying out after that get opened on Christmas. I'll keep you all posted.